Enjoy an unforgettable ‘Big Five’ safari with some great birds and landscapes thrown in! The Okavango Delta transforms a vast swathe of the Kalahari Desert into a wild wilderness home for one of the greatest concentrations of game in all of Africa, including the ‘Big Five’; Elephant, Rhino (Black and White), Buffalo, Lion and Leopard, while other exciting mammals include Cheetah, Brown and Spotted Hyenas, Wildebeest, Zebra, Giraffe, Warthog, Hippo, Chacma Baboon, and Lechwe, Topi, Kudu and Sable Antelopes, as well as one of Africa’s densest populations of the iconic Wild Dog. The delta is also home to over 500 species of birds, including the dazzlingly colourful and exotic Blue-cheeked and Southern Carmine Bee-eaters, Lilac-breasted Roller, Malachite Kingfisher, African Pygmy Goose, African Green Pigeon, Bateleur and Martial Eagles, Pel’s Fishing Owl, Wattled and Saddle-billed Storks and the bizarre African Skimmer. No wonder the nearby Caprivi Strip is ranked number 54 in the World’s top one hundred birding locations. Our visit coincides with the end of the wet season, providing opportunities for wildlife watching by boat as well as in a purpose built, open-sided four wheel drive jeep. At this time, some winter visitors are still present, while the resident birds will be in full breeding plumage. Moving between en-suite tents on private campsites, with our own personal chef, camp crew and wildlife guide, provided by Letaka Safaris, Botswana’s premier safari operator since 2000, and a regular exhibitor at the British Bird Fair, we shall experience the wildlife of this unspoilt wilderness, while camping in style under the stars. 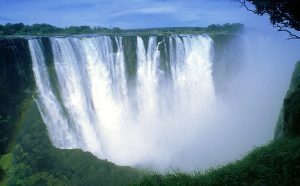 At the end of this fabulous safari adventure, we visit Victoria Falls, the World’s largest waterfall, and one of the seven natural wonders of the world, where the mighty Zambezi plunges 354 feet into a mile wide gorge, so that the constant spray supports a ‘mini rainforest’, with specialities like Bradfield’s and Trumpeter Hornbills, African Paradise Flycatcher and the outlandish Knysna Turaco. With so much to see, even non-birding partners will love it. Day 1 We have an evening overnight flight from Heathrow to Johannesburg, with British Airways. Dinner and overnight in flight. Day 2 From Johannesburg we take a late morning flight to Maun, the capital of Botswana, where we will be met by our local guide and transferred by road, in about three hours, to Xini in the Moremi Game Reserve, where we can start meeting the local wildlife, and then listen to the sounds of the African bush after dark. Dinner and overnight at a Letaka private camp near Xini. Days 3 & 4 We have the luxury of two full days to explore the extensive Moremi Game Reserve, which covers the eastern third of the Okavango Delta. Moremi is one of the most beautiful reserves in Africa, with an unrivalled variety of landscapes teeming with wildlife, including plenty of predators and prey. 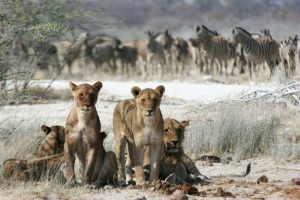 Our time here will include several game drives in a four wheel drive jeep, driven by our local wildlife guide. The many waterways are home to the rare Lechwe, while almost 500 species of birds include African and Lesser Jacanas, Sacred Ibis, Wattled Crane, Saddle-billed Stork, Slaty Egret, Bataleur, Martial and Tawny Eagles, Coppery-tailed Coucal, Pink-throated Longclaw and the majestic African Fish Eagle. Dinners and overnights in camp near Xini. Day 5 We have a full day’s game drive with stops for snacks, a picnic lunch, and of course, wildlife watching en route to our next camp within the Moremi reserve at Xakanaxa. Dinner and overnight at a Letaka private camp near Xakanaxa. 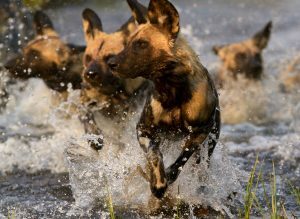 Days 6 & 7 We have two full days to explore this part of the Moremi reserve, while looking out for herds of Buffalo, Giraffe and Elephant, as well as the predators, including several packs of Wild Dogs. As well as a day in the jeep, we have a full day exploring the waterways by boat, in search of the many water birds, such as Goliath, Green-backed and Black-headed Herons, Comb Duck, African Spoonbill, Hammerkop and Pied Kingfisher, as well as Nile Crocodiles. Dinners and overnights in camp near Xakanaxa. 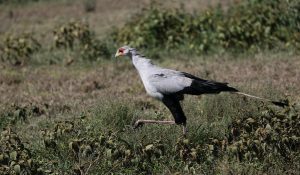 Day 8 We have a full day’s game drive with stops for snacks, a picnic lunch, and of course, wildlife watching en route to our next camp within the neighbouring Khwai Concession, a private reserve alongside the Khwai River. Dinner and overnight at a Letaka private camp in the Khwai Concession. Days 9 & 10 We have two full days to explore this private reserve, which also allows night drives, in search of nocturnal mammals such as Bushbabies, Civets and Genets, as well as birds like Verreaux’s Eagle Owl and Pennant-winged Nightjar. We can also enjoy an exploration of the many waterways here by Mokoro, a silent dugout canoe, allowing excellent photo-opportunities. Dinners and overnights in Khwai. Day 11 We leave Khwai and head north east on a full day’s game drive with stops for snacks, a picnic lunch, and of course, wildlife watching en route to our next camp at Savuti, in the heart of the massive Chobe National Park. Dinner and overnight at a Letaka private camp near Savuti. Day 12 We have a full day to explore the wildlife-rich Savuti Marsh, which teems with Impala, Zebra, Buffalo and Elephant, attracting Cheetahs, Spotted Hyenas, Lions and Wild Dogs, while the prolific birdlife includes Ostrich, Marabou Stork, Helmeted Guineafowl, Red-billed Francolin, Denham’s and Kori Bustards, Yellow-billed and Southern Ground Hornbills, Kittlitz’s Plover, Wattled and Crowned Lapwings, Burchell’s Sandgrouse, Yellow-billed Kite, Pearl-spotted Owlet, Grey Lourie, Yellow-billed Oxpecker, Rufous-naped Lark, Burchell’s Starling and the weird Secretary Bird. Dinner and overnight in camp near Savuti. Day 13 We leave Savuti and continue our journey north east on a full day’s game drive with stops for snacks, a picnic lunch, and of course, wildlife watching en route to our next camp at Kasane on the Chobe River at the edge of Chobe National Park. Dinner and overnight at a Letaka private camp near Kasane. 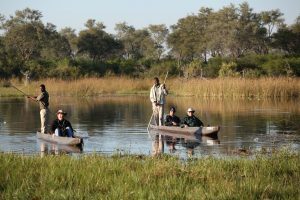 Day 14 In addition to a game drive, we have a boat cruise on the Chobe River, which separates Botswana from Namibia’s Caprivi Strip, and is normally lined by bathing Elephants, as well as African Skimmers and beautiful Southern Carmine Bee-eaters. Dinner and overnight in camp near Kasane. Day 15 We leave Kasane and drive east, across the border into Zimbabwe, where journey’s end is the luxurious Ilala Lodge, with lush gardens and a swimming pool, not far from Victoria Falls. Dinner and overnight at Ilala Lodge. Day 16 We have a full day to enjoy the spectacle of Victoria Falls and the local birds such as Verreaux’s Eagle, Bradfield’s and Trumpeter Hornbills, Black-collared Barbet, Knysna Turaco and various Sunbirds. Dinner and overnight at Ilala Lodge. Day 17 We have a leisurely morning at the lodge before checking in for an early afternoon flight with South African Airways (to be confirmed) from Victoria Falls to Johannesburg, followed by an evening overnight flight to Heathrow with British Airways. Dinner and overnight in flight. Day 18 We arrive at Heathrow early this morning. Cost £5995 This is the same as in 2019, and is excellent value compared to other wildlife tour providers. As spaces are limited, it is advisable to book as soon as possible. Return overnight flights from Heathrow to Johannesburg with British Airways, flights from Johannesburg to Maun and from Victoria Falls to Johannesburg, all transport in Botswana, fifteen nights’ full board en-suite accommodation, all game drives, boat rides and reserve entry fees (except Victoria Falls), wildlife checklist and the services of your guides. The flight time between London and Johannesburg is about 11 hours. Both journeys involve overnight flights. The local flights between Johannesburg and Maun and between Victoria Falls and Johannesburg take around one and a half hours. A visa is not required for British citizens to visit Botswana, and a visa for Zimbabwe can be obtained on arrival. It is advisable to be vaccinated against Hepatitis A. There is a variable risk of Malaria and so prophylaxis is advisable. 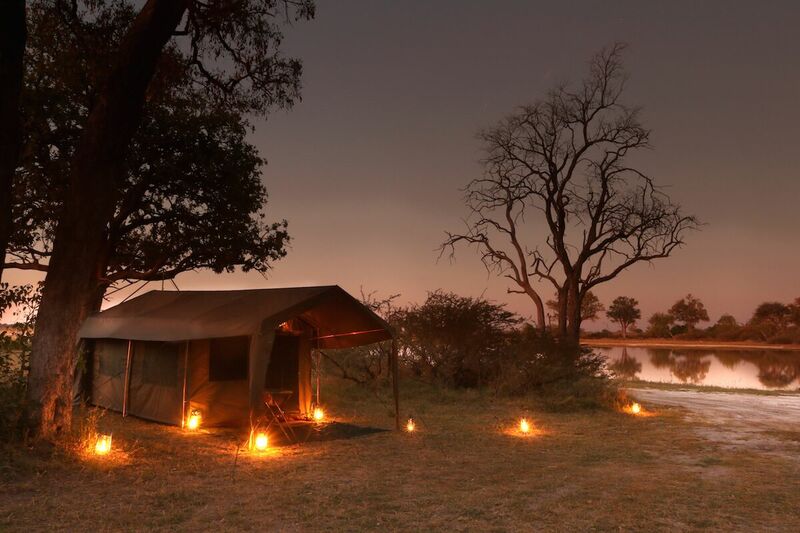 We shall be staying in en-suite safari-style tents in remote wildlife rich areas, as well as a luxury lodge with swimming pool and gardens very close to Victoria Falls. In March, temperatures range from 18 – 31°C, with 2.4 inches of rain, which is roughly half as much again as the amount we get in the UK in March. We can expect to see around 220 bird species, as well as around 30 different mammals, with excellent photo-opportunities.